If you’re familiar with Bento 2 ( ), the easy-to-use personal database application for your Mac, then you won’t be surprised to learn that Bento for the iPhone and iPod touch is as capable and powerful a database application as is its desktop counterpart. Think of FileMaker’s $5 Bento as a “two-mints-in-one” application that can be used by itself on your iPhone or iPod touch or in tandem with its desktop counterpart. Databases By the Dozens: You’ll find 25 pre-designed templates in the mobile version of Bento, which also lets you build your own library from scratch if you prefer. In its standalone form, you can use Bento to create databases—called libraries in Bento parlance—and manage a wide array of information right on your iPhone without ever needing a copy of Bento on your desktop Mac. The app ships with 25 pre-designed templates for storing a variety of data, from recipes and exercise logs to home inventories and vehicle maintenance. But you aren’t limited to using the library templates that ship with the program. Using Bento’s Blank template, you can build new libraries from scratch with almost exactly the same capabilities as databases built on the full desktop version. On the iPhone and iPod touch, Bento integrates with your Address Book contacts, Mail, Safari, Google maps, and (for iPhone users) the phone dialer; you also can use the phone’s built-in camera or photo library to add pictures to your database. The only thing I found I couldn’t do on my iPhone was create a field with a calculated result or create relationships between two libraries—small potatoes given Bento’s other capabilities. Creating new databases using Bento was relatively easy, but subject to the normal limitations of typing on the iPhone. It’s certainly not as easy as typing on a full-sized keyboard, though not a difficult task either. I did have some initial difficulty finding the “Fields” button that you need to use to add or edit fields to an existing database—Bento requires you to open an existing record before you can add or delete database fields. Once I figured this out, I had no problems making changes to the database fields. While using Bento on your iPhone or iPod touch is great, you’ll find that the app gets even better if you have a copy of Bento 2.0 v4 or later on your Mac. That’s because the Bento app syncs with Bento on the desktop over a Wi-Fi network. Any databases you create on the iPhone or Mac, or any of the data you’ve entered can be easily transferred between your desktop and your phone. There’s an added advantage here—while you can’t create calculated fields or relationships between two libraries on your iPhone, calculated fields and relationships created in the desktop version of Bento work perfectly when synced back to your mobile device. 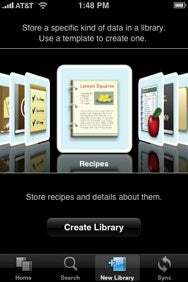 Bento for the iPhone and iPod touch is an amazing, versatile, and powerful application, making it possible for you to create databases and manage a variety of information, all from your mobile device. Combined with Bento on your desktop, the Bento app is the best, easiest to use database application you’ll find on the iPhone or any other similar device. Bento is compatible with any iPhone or iPod touch running the iPhone 2.2 software update.